The legs continuously carry the entire weight of a person and ankles and the feet take care of contact to the underlying surface. The Lower Leg consists of two long bones. The tibia or the shinbone is the larger one and the fibula or the calf bone is the smaller bone located on the outside of the leg. The calves have strong muscles. 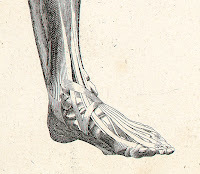 The Achilles tendon connects the calf muscles at the back to the heel bone. The ankle joint connects the lower ends of the tibia and the fibula in the lower limb with the foot. From the ankle down, the foot consists of 26 bones. This structure makes movement to be possible in various situations. Calf muscle may be painful pain due to too much of exercise and lack of stretching. Sudden strain on unprepared calf muscle or a direct blow can also cause calf pain. Excessive running up the hills is often a considerable stress for calf muscles. Certainly some soreness in the muscles is a normal situation after training. If treatment is needed it is easy and results are favourable. In the beginning, complete rest is needed until the pain and tenderness go away. It may take some days or a week or two. Cold packs in the beginning are useful. They can be applied several times a day for 15-20 minutes at a time. Later on heat may offer a better result. Massage and stretching can be used to relax the muscles. Calf muscles are easy to massage yourself. It should be done with gentleness without excessive force. Also over the counter pain medication are available for self treatment if necessary. Shin splints or tibial stress syndrome is a term used to describe pain at the front of the lower leg. Athletes often have problems with the shins and calves due to muscular growth after exercise. When the membranes surrounding them do not grow at the same rate, the muscles have to function with this increased pressure and this may cause pain. Shin splint pain is considered to be born from overuse or repeated pounding of the feet stressing the tibia and surrounding muscles and causing irritation. Flat feet or inappropriate footwear may predispose to this problem. Shin splints are an example of this condition. With shin splints, initially pain during exercise may be experienced in the inside area of the tibia. Shin splints normally do not develop right away, but, for instance, after a extensive training period. Problems usually start after excessive aggressive training in sports or for example in the army during basic training with a lot of marching. As the problem gets worse, the pain is felt after each exercise session and sometimes it lasts for hours. Examination shows tenderness on the inside of the tibia. The shin muscles may feel tender as well. Sometimes x-ray or MRI I needed to eliminate stress fractures and other possible conditions. Treatment includes taking a break from exercise. Anti-inflammatory pain medication and cold compresses are useful. Discussion with the coach should be held whether it would be needed to change the running style, for instance. Attention should be paid to muscle tone and stretching. If the situation does not improve, surgery sometimes can be used to make more room for the muscles by opening the membranes surrounding them. Restless legs are a condition where there is nighttime shivering, tingling, pain or burning in the legs that forces the sufferer to get up and move the legs in order to relieve the symptoms. Moving the legs gives at least a temporary relief. It is customary to have also limb jerking during sleep. The disease usually affects both legs. Moving the legs or taking a short walk will calm the symptoms. Examination may not prove anything unusual in the legs. Rarely the underlying cause may be diabetes, sciatica or anemia. Repeated nighttime waking may lead to insomnia. Diagnosis bases on the typical history and doctor´s examination. Sleep registration is rarely used. Sometimes nerve conduction studies and EMG may be needed to exclude other conditions. The cause for this condition is unknown. Hereditary may play some role. It is thought to be connected to chemical changes in the brain, beginning nerve degeneration in the legs or beginning circulatory problems. Self-treatment includes walks before going to bed. This may reduce the nighttime symptoms. Sleep positions may affect the condition, so try several to see which works best. Heat or cool footbaths help some of those suffering from this condition. The legs should be warmed carefully with the help of a heating pad and kept warm with socks at night. Smoking should be stopped as well as using excessive coffee and alcohol. Intermittent claudication is the name for the symptom with an aching pain in the calves—more rarely in the thighs or gluteus muscles—when walking. It is caused by reduced blood circulation due to arterial calcification and narrowing and hardening of the arteries. It is one manifestation of the peripheral artery disease, a common problem of men over 50. The risk factors are among others elevated levels of cholesterol, diabetes, coronary artery disease, high blood pressure and smoking. Walking causes the muscles to require more oxygenated blood and the calcified arteries cannot deliver enough blood, which causes the pain. In the beginning, the pain may appear only when walking faster or longer, gradually symptoms come with less strain. The legs get cold easily and look purple. If blood circulation is particularly poor, the legs look pale. Nighttime pain and coldness may be an indication of threatening gangrene. Examination shows lack of pulse, and listening with a stethoscope reveals a shushing sound in the veins that are blocked. Intermitted claudication is examined using the ankle-brachial index meaning relationship between blood pressure in the arms and legs. Doppler ultrasound is used to measure flow in the arteries. If operation in considered angiography, magnetic resonance or computer tomography angiography may be used to get a better understanding of the arteries involved. Treatment consists of moderate walking and keeping the legs in superb condition. If walks become terribly short, surgery may be considered. Quitting smoking is essential so that blood circulation in the legs will not be further reduced. Drugs are used to relieve pain, keep the blood from forming clots in the arteries and to lower elevated cholesterol. Also, a medication to enlarge the affected arteries may be used. Self-treatment includes walking at least an hour a day. Walks should be continued to the point where the pain becomes quite strong. After a brief pause, as the pain subsides, moving can be continued. A good way to strengthen the calf muscles is to walk up stairs and to make specific exercises for this at the gym. Diabetes, use of alcohol, rheumatic arthritis, kidney insufficiency and various chemical substances may cause nerve damage in the legs and therefore pain. The nerves in the legs are the longest in the body. This is why initial changes in nerve function often are demonstrated there. Leg pain is often associated with diabetes due to leg neuropathy. Diabetes may develop nerve damage throughout the body. It is able to do damage to the blood vessels carrying oxygen to nerves and also to help factors that cause inflammation in nerves. Those who have had diabetes for a long term will feel pain more often, but new patients may experience it also. Sometimes starting diabetes medication makes the pain to be worse. The pain is like a toothache, felt deep, burning or piercing. Numbness or tingling may accompany the pain. In the long run there may be also wasting and weakness of the muscles of the feet. Examination shows changes in the leg reflexes as well as weakening of vibration sense. Nerve conduction studies and EMG can usually confirm the diagnosis. Treatment is often difficult. Taking excellent care of the primary disease is essential. Anti-inflammatory pain medication and physical therapy may work. Electric therapy for the legs and acupuncture may be worth trying. Neurological medication such as anticonvulsants and antidepressants may help. Severe cases may require anesthetic procedures and an electric therapy device placed in the spinal cord. An embolus or a blood clot loose in the arteries may sud denly block circulation in the legs. The embolus usually comes from the heart, aorta, or through a hole in the septum from the venous circulation side. The obstruction of the blood vessels prevents tissues from getting blood and oxygen and may lead to death of the starving tissues. Main symptom is a sudden, severe leg pain. The leg becomes lighter in color, cold and numb. Examination shows no pulse, coldness, numbness, and a pale or marbled skin. There may be also muscle pain and spasm and lack of movement in the leg. This situation requires emergency vascular surgery, because a leg will not be able to survive without blood circulation for long. Various tests and imaging techniques are available to detect embolism and to discover the source. In addition to surgery, treatment may also include intravenous procedures such as thrombolytic therapy and medication. Results of the treatment depend on the location of the embolus and the promptness of the treatment. Arterial embolism is dangerous if not treated quickly and can lead even to amputation. Venous thromboses are also seen in the legs. Their risk increases for instance during long flights. In this ailment, there is pain, swelling and burning in the leg. Doctor´s examination, ultrasound and a contrast medium x-ray examination, lower extremity phlebography, will help diagnose this condition. If a venous thrombosis is suspected, a visit to the emergency room is necessary. The leg should remain immobilized during transportation to the emergency room. The veins return blood to the heart and a clot from the veins can be transported to the right side of the heart and further into the lungs. A pulmonary embolus is a serious illness and can lead to death if not diagnosed and treated like an emergency. The ligaments of the ankle joints are easily sprained. They have some elasticity but if stretched outside their limits they are sprained or torn. The ankles have the least support when they are fully extended. An ankle usually twists inward, which injures ligaments on the outside. The injuries vary from sprains to a complete tear. When the ankle twists outward, injury to the bones is more common because the inside ligaments are so tough that the bone will break before they tear. After the injury there may be local tenderness and swelling and maybe some limitation of the movements in the torn ligament fibers. If there is a complete tear of the ligament, or a fracture there may be additional movement in the ankle joint when tested. Diagnosis is made with typical record of events and doctor´s examination. Sometimes x-ray is needed to exclude fractures. Jn more complicated traumas MRI may be needed to be able to determine the best treatment options. Fresh ligament tears are usually treated with an adhesive binding. Rest is usually needed and walking should be limited for some days or weeks. Cold packs several times a day for 20 minute or more and pain relieving medication can be used as self treatment. If function level does not return to normal soon after the injury, physical therapy is needed to improve it. Surgery is rarely used for this condition. After the acute pain episode related to sprains, the functioning of the ankle can be improved with exercise. One can start by moving and rotating the ankles in all directions, then stand on the toes and heels. A small step can be used under the forefoot in this exercise if a wider range motion is wanted. At a later stage, a balance board is beneficial for improving ankle function. Gym exercises with a personal trainer or a physiotherapist offer an opportunity to gain increased muscle power to keep the ankle in optimal shape for the future. With the adequate treatment the results are good and usually there remains no limitation of earlier activities. Arthritic changes in the joints of the ankle and foot are not as usual as arthritis of the hip or knee. In the ankle joint also in other 30 joints in the foot there may be osteoarthritis, wear-and-tear arthritis or degenerative joint disease. With it the cartilage of the joint is wearing off with age. After this the bone surface is exposed in the joint and the joint becomes progressively more painful and stiff. Hereditary causes may play a role in the development. Also overweight, injuries and fractures in this area predispose to this disease. The second type is inflammatory arthritis. It can be caused for instance by rheumatoid arthritis or some other systematic disease. This is a system-wide disease and there is usually pain in other joints and other symptoms. The diagnosis can be confirmed by doctor´s examination and laboratory tests. When arthritis is present, the affected joint may feel sore, raspy and stiff when moved. There may also be tenderness and swelling of the joint, reduced movement in it and difficulty of walking. X-rays or MRI can confirm the diagnosis. The Achilles tendon, which is attached to the heel, may rupture or become inflamed from overuse, strenuous exercises or other stress to the tendon. It is a remarkably strong tendon and it takes a lot of power or misalignment to make it tear. A tendon rupture can be partial or complete. An inflamed Achilles tendon feels painful and there may be swelling or thickening at the back of the leg and above the heel. There is often pain in this same area when running longer distances or sprinting. Stiffness in the morning along with a scratching sound may follow. An inflammation generally follows a more straining exercise. Tendinitis treated with anti-inflammatory drugs, cold compresses, and rest. A cortisone shot may be needed. If this does not return full function of the tendon, surgery is an option. If not treated properly degeneration and prolonged problems may continue to bother. The pain with the ruptured Achilles tendon is usually more intense and sudden. One may hear the sound of the rupturing tendon when the injury occurs. It may be impossible to walk on the toes and put weight on foot on the side of the trauma and walk normally. The rupture may follow a rapid surge of strain on the tendon like occasional unaccustomed sports, stumbling or stepping into a hole. Diagnosis is made with doctor´s examination, typical history and findings. Sometimes ultrasound or MRI is used to define the scope of the inflammation or the rupture or the tendon. Partial ruptures may be treated with cold compresses, medicine, cast and rest but complete ruptures are usually operated. Nerves may get pinched behind the bump on the inside of the ankle causing a condition called tarsal tunnel syndrome. An injury, a heavy shoe, rheumatic inflammation or an incorrect position of the ankle may cause this condition. Main symptom is a burning pain, not associated with walking, on the midfoot, around ankles and sometimes on the toes. Pain worsens with activities and when standing for a long time. Pressing the nerve path under the bony part on the inside of the ankle can mimic the pain and sense of electric current. A neural pathway examination, EMG confirms the diagnosis. Treatment consists of eliminating the wrong position or other aggravating factors. Surgery performed to release the nerve is very rare. Humans have a padded cushion under the heel bone, and it gets less elastic with age. Some may have congenital defects in it. This area may become irritated or pad may be bruised due to injury or physical exertion. In this case, examination shows tenderness directly under the middle of the heel bone. The ailment is called the fat pad syndrome. Treatment may include adequately soft shoes that have flexible soles, or a soft heel pad placed in the shoe. This changes the stress point and adds more padding to soften blows. The painful area can be treated with a local anesthetic or cortisone. Lose weight if you are overweight. Try changing the way you walk. Prolonged pain may be problematic in professions that involve a lot of standing. The weight of the leg normally rests on three points: the heel and the bases of the little and big toe. These points are prepared to carry the weight. The lateral and longitudinal plantar arches are found between the big toe and little toe bases and the heel. If this situation changes when, for instance, the arches fall or when the foot twists in some direction, it may cause various problems. A falling longitudinal plantar arch causes stretching of the tissue band connecting the heel bone to the base of the toes. This may give rise to an inflammation of this tissue band and cause a condition called plantar fasciitis. Doing too much running or jumping can provide additional irritation. In the long run this may cause an osteophyte or a spur to grow in the area of attachment of the tendon to the heel and the area itself may be painful. In this case the spur is the result and not the cause. Examination shows localized tenderness in the front part of the heel bone. Treatment consists of rest and possibly local administration of cortisone. There may also be inflammation and pain in a bulge in the area where the Achilles tendon inserts behind the heel into the heel bone. This malady is called retrocalcaneal bursitis. One can see this from wearing shoes that rub this section or from running too much. This problem is usually resolved changing better shoes and limiting time of exercise. As a consequence of a fallen lateral plantar arch, the metatarsophalangeal areas or area of the joints between the bases of the toes 2-4 and the forefoot may take on too much weight and become painful as a result. This disease is called metatarsalgia. Sharp pain or a feeling like walking with a pebble in the shoe feels in the sole just behind the first, second, third or fourth toes. It is usually worse when standing, walking or flexing the feet. In this case, one can raise the painful area from the sole with a soft padding under the second and third metatarsal forefoot bones. It must not be placed directly under the painful area, but about a half an inch toward the heel, so that there will not be pressure on the painful area. This condition is not serious and treatment with anti- inflammatory drugs, cold packs and rest can often take care of the symptoms. Good footwear, with additional shock-absorbing insoles or arch supports may also be useful. The nerves between the bones of the metatarsal bones may get pinched between the second and third and third and fourth bones of the metatarsus in the forefoot. This condition is called Morton’s neuralgia, and it is common in middle-aged females. A shooting pain to the affected toes is felt in this area immediately when standing up. Also numbness and sensation of tingling or pricking may be experienced. In doctor´s examination there is pain when the bones are pressed together from the sides. Localized pain is also felt in the affected region between the metatarsus bones. X-ray, ultrasound or MRI may be used to exclude other conditions. Treatment consists of the same type of foot support as in metatarsalgia. Good, wide enough shoes should be used. Cortisone injections may be used to get relief. If there is no improvement, surgery is a rarely used option. Stress fractures are seen in the metatarsus bones. At least moderate intensity exertion usually precedes the problem. Examination shows tenderness in the area of the stress fracture. Changes will initially not show in x-rays, but are usually found in follow-up. Treatment consists of reducing stress on the foot. Hallux valgus is the most common problem of the frontal part of the feet. Its primary source appears to be congenital weakness, but wearing unsuitable shoes may worsen the condition. In this condition, the first metatarsal bone turns inward and the toe itself turns outward. Arthritis may develop in the joint at the base of the big toe or in the metatarsophalangeal joint and a nasty inflammation of the mucous bursa may appear on the outmost point. A bunion is an enlargement around this joint. Main treatment consists of wearing well-fitting shoes and using an orthopedic splint. Surgery may be an option when the pain is severe. There are two types of arthritis. The most common is osteoarthritis, slowly progressive wear-and-tear arthritis or degenerative joint disease. With it the cartilage of the joint is wearing away with age. After this a bone exposes in the joint and it becomes painful and stiff. The second type is inflammatory arthritis. It can be caused by rheumatoid arthritis or other systematic diseases. Problems of the toes are rarely the first and only symptom of the inflammatory disease. In joints of the feet osteoarthritis most often affects the joint at the base of the big toe. In other toes it is met less frequently. In normal walking, the first toes turn upward at the end of each step. If there is arthritis in the base joint, it may cause pain and make walking extraordinarily difficult. Treatment consists of a support that will prevent the big toes form turning upwards. The best option is the so-called rolling shoe, where the sole of the shoe is rounded to help to walk. Self-treatment includes temporary use of OTC anti-inflammatory drugs and gel application in the painful area. Cold compresses several times a day are usually effective. The toes or legs should not get cold if the circulation is poor. When pain is at its worst at the onset, the most valuable thing to do is to reduce the amount of exertion involving feet. Using a cane, not carrying anything, and losing excess weight help accomplish this goal. Well-fitting shoes are of paramount importance in painful foot conditions. Running shoes have to be well padded. Running long distances on hard surfaces should be avoided, and increasing the length of runs should be made gradually. The more one exercises, the more one should stretch muscles afterwards. Walking barefoot in the summer is a traditional strategy to strengthen the foot muscles. During winter, it is possible to exercise the feet by spreading the toes and learning to grasp objects with the toes. If running is too tough for the feet, another type of exercise should be considered. Swimming and biking are convenient ways to train and provide less stress on the feet. Calluses and corns should be treated carefully and the skin kept from cracking. A foot file should be used and feet be greased regularly. Warm baths can be tried or devices that massage the feet gently. They may reduce the tension in the muscles of the feet. The most common problem caused by congenital structural weakness of the feet is the so-called hammertoe. It is a abnormality of the second, third or fourth toes. They bend at the middle joint, so that foot resembles a hammer. Mallet toe is similar, but the deformity is in the upper joint of the toe. The cause of both ailments is inappropriate shoes not fitting properly or a weakness of the structures of the feet. Different supports, toe exercises and surgery are used to treat these conditions. One possible explanation for repeated attacks of acute inflammation of the metatarsophalangeal joint at the base of the big toe is gout. Gout is a metabolic illness, in which uric acid salts accumulate in the system. For some reason, the first place this illness manifests itself is in the joint of the big toe. The disease starts here in over half of the patients. This inflammation is intensely painful and the joint may be clearly swollen and reddish. A synovial fluid analysis, laboratory tests, and x-rays or MRI confirm the diagnosis. Treatment consists of medication and diet. Without permanent changes in the diet, this illness has a remarkably high probability of recurrence. The foods in the diet that are high in nucleic acid should be restricted. These include offal, roe, small fish, beans, etc. Some drugs, for instance diuretics, may increase the amount of uric acid salts. Traditional warnings include using only moderate amounts of cognac, port wine, and champagne. Strong leg pain, paleness of the leg, and loss of pulse in it. Sprained ankle if you have problems moving. Sharp pain in the region of the Achilles tendon after exercise and loss of range of motion in the foot. Foot pain that limits functioning. Swelling and pain in the big toe. Foot pain strong enough to wake you up at night. Prolonged pain that is not alleviated with self-treatment. Unusual, painful positions of the big toe or other toes. Burning pain in the sole of the foot. Vascular.co.nz page about intermittent claudication. Mayoclinic.com pages on restless legs. Familydoctor.org pages on diabetic neuropathy. Mayoclinic.com pages on shin splints. National Heart, Lung, and Blood Institute about deep vein thrombosis. Angiologist about blue toe syndrome. American Academy of Orthopedic Surgeons on arthritis of the foot and ankle. Mayoclinic.com pages on achilles tendinitis. Emedicine article about tarsal tunnel syndrome. American Academy of Orthopedic Surgeons on heel pain. American Academy of Orthopedic Surgeons on plantar fasciitis. Mdguidelines.com page about bone spur. American Academy of Orthopedic Surgeons on flatfoot. American Academy of Podiatric Sports Medicine page about Morton's neuroma. Emedicine article about metatarsal stress fractures. Wikipedia page on hallux valgus or bunion. American Academy of Orthopedic Surgeons on rheumatoid arthritis of the foot and ankle. American College of Rheumatology pages about gout. For relaxation and comfortable after a long day we may use foot massager machine. Foot massager machine give them that in our home also after the day. When we came back in home. I love to use it regularly. I also suggest my many friend for foot massager. The BioSkin TriLok however is designed to act as an external ligament, controlling inversion and eversion of the ankle. It works to control the motion of the forefoot whilst not restricting the movement of a person in terms of walking and running. Thanks for sharing the long and useful article. For problems related to foot and calf pain, I usually do massage with tennis balls or with specialized massage balls. For problems related to ankle pain, I often do stretching. Feel much better. ~ My website.